Now we’re moving towards “Summer”, I’m hoping to replace my regular Sufferfest workouts with short loops starting and finishing at home. I’m targeting 90 minutes as a basic outing, more ambitious trips will be saved for special occasions, predominantly weekends. I’ve already ridden most of the likely circuits; they represented my early cycling challenges, back in the days when I was just starting out and very low on strength and stamina. Variations have been added over time to increase the distance and create some variety, but they are based on the same basic routes. Today’s ride, however, felt a little different. Familiar landmarks came alive. The lunchtime outing made the cycle a whole new experience. As it was a week day, things were happening… there was activity and people. It caught me quite off-guard! As I wound my way through a sleepy little village, I encountered my first surprise… a funeral procession. From a distance, the bagpipes should have made me suspicious, but I was in my “meditation” zone. I turned a corner to find quite a gathering of people and a hearse approaching the graveyard. 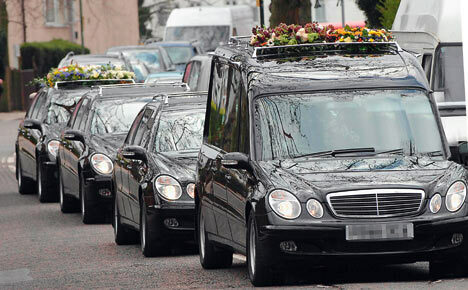 Before I knew it, I was adjacent to the hearse, unsure of the etiquette but fairly sure I’d already blown it. With few other options, I slammed on my brakes and proceeded in what was intended to be a sedate, respectful manner. Once I was clear, I accelerated swiftly away, hoping I had gone unnoticed. Overtaking slow moving traffic isn’t always the best course of action! In retrospect, I probably should have stopped to pay my respects, but for how long? And, is it possible to pay respects in Lycra and light-enhancing glasses? On the bright side, I could have collided with the hearse, or panicked and toppled over, both of which I suspect would have been much more intrusive. The school car park, which normally serves as a pit stop location, was also compromised today. Being lunchtime, the kids were outside playing. Once again, I didn’t consider school gates a particularly appropriate place to hang around dressed in Lycra. To avoid any risk of “incident” I carefully selected an alternative place to have a short rest. As I headed home, fighting against a strong head wind and a persistent mizzle, I encountered a sign containing possibly the most dreaded six words for a cyclist (for me at least) “WHEN RED LIGHT SHOWS WAIT HERE”. The road works themselves appeared insignificant, but the bollards disappeared far into the distance. I have several major fears regarding road works like this: a drag race with cars off the line when the lights turn green, increased pressure when “re-cleating”, the lights changing too fast leaving me in limbo with traffic approaching in the opposite direction. Overall they exacerbate many of my concerns with cycling generally. 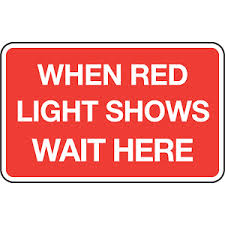 When I’ve encountered road works at weekends, I’ve often felt like I was featuring in a hidden camera comedy show, sitting patiently at the lights waiting for non-existent road works. At least today there was some activity however pathetic. Fortunately, and much to my relief, I was able to negotiate the road works without incident, and I was free to slug out the remainder of the trip in relative peace. So… another quiet, uneventful ride completed. What will tomorrow have in store? This entry was posted in Cycling and tagged Cycling, Funeral Ettiquette, Lunchtime Cycle on April 3, 2014 by Paul Squire.